Moog Polymoog Synthesizer reference sheet from 1980. Someone asked me if I had any type of reference sheet for the Polymoog Synthesizer. I love requests! :o) This one is part of a large family of reference sheets that Moog printed in 1980. I've seen scans of the front of this reference sheet on the Web in a few places, including dubsounds.com and isaotomita.net, but the back of the sheet is harder to come by. 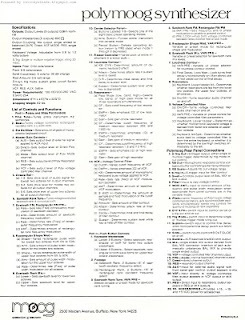 Sure, the front of this reference sheet has a beautiful photo of a Polymoog Synthesizer, but it is the back of this sheet that provides all the juicy reference information you have ever needed. All in one location. If the saying 'more than the sum of its parts' is true, then the Polymoog must be one hell of an instrument. Of particular interest to me, and apparently a few others, is the very very unique Resonator section (section 13 in the reference sheet). Ken Elhardt describes it as a "3-band 'Resonator' section that allows Formant-Filtering in addition to its dynamic Filters". And he should know. He took the Resonator section out of his Polymoog (Gaah!) to create a stand-alone unit. And although it hurts me plenty to see the guts ripped out of any synthesizer, his Youtube video is a great demonstration of a disembodied Resonator in action. Jürgen Haible went one step further and created a printed circuit board that recreated the Resonator circuit. The page also includes an audio sample he made with his prototype. Check out some of his other projects (PCBs, synthesizers and music!) on his Web site. So, you may be asking - what did Ken do to the rest of that Polymoog once the guts were ripped out and sold off? Well, Ken made it into a coffee table. No, seriously. It even has drawers. 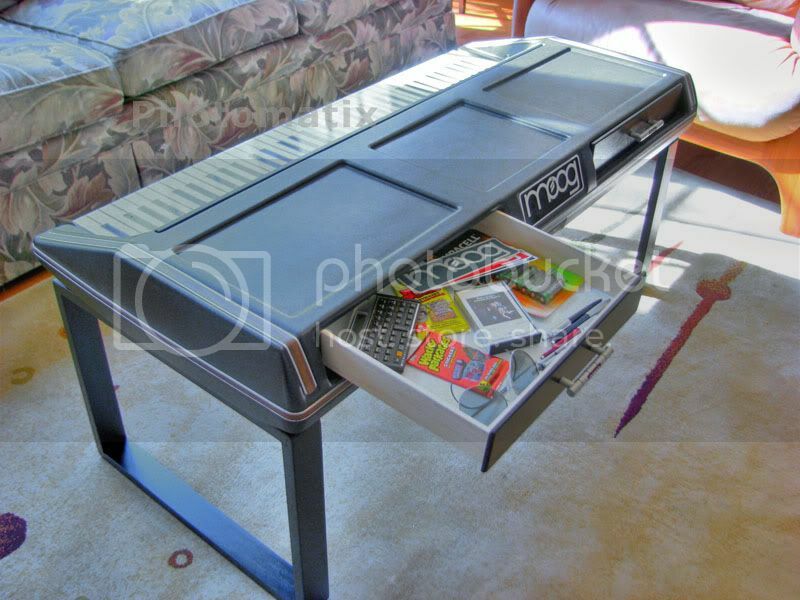 You can find more links to pictures of it on MATRIXSYNTH. 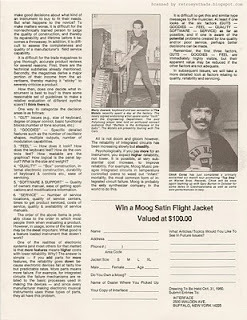 Moog Polymoog Synthesizer ad from page 5 of Contemporary Keyboard Magazine June 1977. This is the second Polymoog ad to show up in CK, running in a few issues between June and September 1977, during the time that Moog had a monopoly on page 5 (which was most of 1977). Great real estate if you can get it - right across from the "Letters" section. I scanned and uploaded the first ad back in June of last year. That post also included the description of the machine from the Spec Sheet section of CK. While recently speaking with an acquaintance at my local music store hang-out, we got onto the topic of the Polymoog. 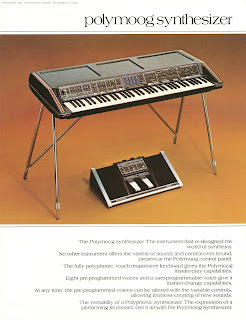 How cool it was that the Polymoog was *fully* polyphonic and had a touch sensitive keyboard. But when we started talking about the editing features, I soon realized we were talking about two totally different instruments. When I asked him to clarify whether we were talking about the Polymoog Synthesizer or the Polymoog Keyboard, he looked at me with a blank face. We took over one of the audio editing demo computers and started surfing around so I could show him the differences. Wikipedia's Polymoog page is quite good for some basic info (compared to some of Wikipedia's other synthesizer pages) and pretty much sums it up. Basically, the name Polymoog can either refer to the original Polymoog Synthesizer or the largely pre-set Polymoog Keyboard. The latter was basically a stripped-down version of the first, similar in appearance and sharing the same case and keyboard. 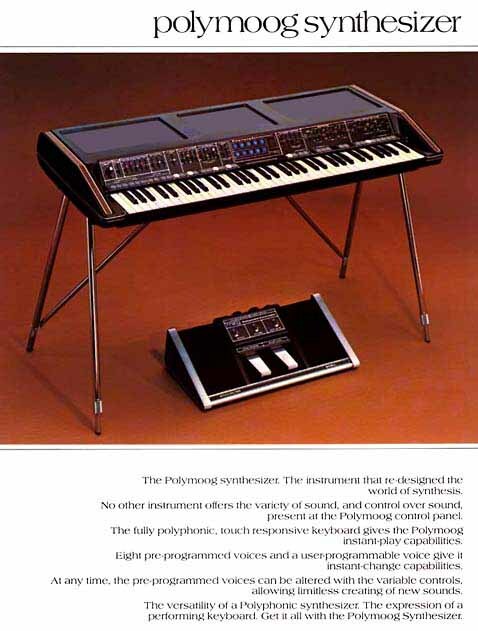 You can compare the image of the Polymoog Synthesizer from this ad and the one on Wikipedia with an image of the Polymoog Keyboard from this blog post. You can definitely tell there are quite a few differences. 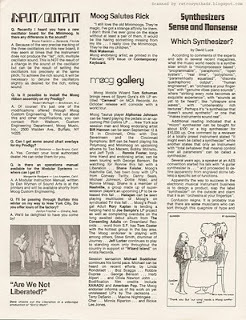 Synthesizer- 1976 (some sites say 1975). *According to synthfool.com's 1979 Moog price list. Synthesizer- Eight: strings, piano, organ, harpsichord, funk, clav, vibes, and brass. Keyboard- Fourteen: vox humana, string 1, string 2, electric piano, piano, honky tonky, clav, harpsi, brass, chorus brass, pipe organ, rock organ, vibes, and funk. Looking at the right-side of the front panel, the Synthesizer had a full section of controls that the Keyboard was missing. This included extensive controls for loudness contour, resonators (low, medium and high controls) and voltage controlled filter (cutoff, Q, modulation and envelope controls). The left-side of the front panel had a few controls in common. Both had pitch and beat controls, as well as octave balance (volume for low, middle, and high octaves of keyboard). But that is where the similarities ended. The Synthesizer had a host of other editing controls in the right-hand side: external keyboard glide control, master gain controls, and extensive oscillator modulation sections that included controls for sawtooth FM/rectangular FM/PM, rectangular (pulse width) shape/mod, and sawtooth levels. The Keyboard version only had some simple hi-pass filtering, attack rate, and basic modulation controls. There are a number of Web sites out there with some good basic information, including Vintage Synth Explorer and synthmuseum.com. But the *best* Polymoog site I have ever found has got to be Dubsounds Polymoog Owners Club, "dedicated to owners and enthusiasts of Moog Polymoog 203a and 280a synthesizers". It has the most comprehensive history of the Polymoog that I've seen anywhere, a great scan of the manual, and much more. Oberheim Synthesizer Expander Module (SEM) from page 17 of Contemporary Keyboard Magazine November/December 1976. This ad ran only a handful of times in CK magazine with the last appearance I could find occurring in September 1977. As mentioned in my previous blog post, I'm kind of playing catch-up with older Oberheim ads, mostly because of my inexperience with their early polyphonic systems. But this ad strips the system down to the 'basic component' - the Synthesizer Expander Module, aka SEM. And I've always loved the SEM. Vintagesynth.com has an SEM page with a bit of tech info if you want to learn more about the module, but basically the SEM was a keyboard-less monophonic synthesizer module, used to beef up the sound of other manufacturer's synthesizers. I always loved the sound of the SEM - and I can still recall the first time I heard one in my friend's basement. That same basement where I came across many of my first synthesizer catalogues and a certain someone's custom built modular synthesizer. More importantly though, The SEM was also the building block to begin your journey to creating a polyphonic Two-, Four- and Eight-voice system. And as mentioned in the ad, if you already had one SEM and were ready to take the polyphonic plunge - no problem - you could even buy the entry-level Two-Voice system with only one SEM installed, so you could pop your SEM right in next to it. According to synthmuseum.com's Two-Voice page, the original Oberheim Two-Voice started out as an incomplete Four-Voice with two SEM modules missing. The 'fixed-configuration' Two-Voice, as seen in the ad photo, didn't make it into production until 1976. "The new SEM is pretty much the same as the original, that is to say 100% analog! True voltage controlled oscillators, the classic SEM multi-mode filter, analog VCA, analog envelope generators and LFO. Did I say it is 100% analog? In fact, I made the circuitry as close to the original as possible." According to the audiomidi.com Web site, a new SEM module, with midi-cv conversion, goes for $899.00 US. This ad tells us that an SEM in 1976 went for $695 - that converts to approximately $2200.00 US today. Oberheim Polyphonic Synthesizer Programmer from page 19 of Contemporary Keyboard Magazine September/October 1976. This ad was the first by Oberheim in CK magazine to feature the Polyphonic Synthesizer Programmer. And it must have been a very new addition to the Oberheim family of add-ons for their polyphonic systems because the programmer wasn't included in the Oberheim family ad that ran just two months prior. But Oberheim must have known it was coming because they left a nice little square of empty space (with the most awesome logo in the business) on both the Four- and Eight-Voice synthesizers in that earlier ad photo. 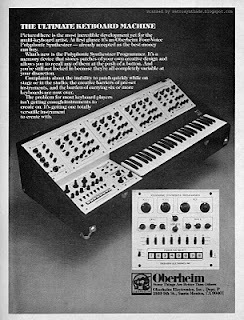 I've really been ignoring my early Oberheim ads lately - probably because most of their early ads were for the Two-, Four-, and Eight-Voice systems, and even though I've played with SEM modules over the years, I've never known much about the complete polyphonic systems, and in particular how the programmer integrated into them. "Designed to function with the Oberheim 4- and 8-voice polyphonic synthesizers, the programmer allows the performer to store patches in a memory unit. The controllable parameters can be set and stored separately for each Expander Module in the synthesizer. Sixteen complete programs can be stored." Mark Vail's Vintage Synthesizers book adds that it "enabled the user to store the knob settings of the voltage-controlled parameters of each module. It was the first programmer of its type made available to the public". The book also gives a bit of technical detail about the connections, stating that SEM modules connected to "some sort of master programming device" through colour-coded connectors located on the circuit board. Now, some might say that this is quite the round-about-way to get polyphonic sound/patching out of individual monophonic synthesizer modules. And according to the book Vintage Synthesizers, it was. 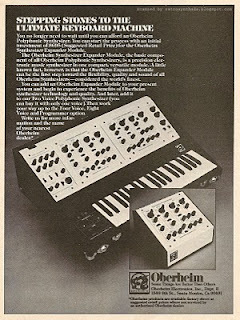 Initially, Oberheim considered themselves in the accessory business with the SEM - figuring musicians would use it mostly as a tone generator for the their sequencer or to fatten up other manufacturer's synthesizers. But circumstances with cash flow dictated that they come up with some new products rather quickly, and so they combined the SEM modules with a keyboard, simple sequencer, and later the programmer. "Complaints about the inability to patch quickly while on stage or in the studio, the creative barriers of pre-set instruments, and the burden of carrying six or more keyboards are now over." Not a bad way to get started in the polyphonic synthesizer business. 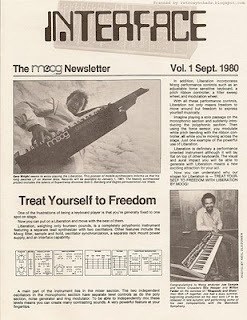 Moog Interface newsletter, Vol. 1 Sept. 1980. I've been scanning some newsletters slowly over time so I could draw on them when I'm having a busy time at work. And, it is perfect timing since I recently saw a flurry of activity when a few of these went up on eBay. 9. Describes Moog's process of pre-aging integrated circuit boards in ovens as weeding out "infant mortality"
7. Pushin' synths on school children - "for the cost of a sax, you can own a Micromoog"
5. Photo of Marty Jourard from The Motels. 3. The Los Angeles Times cartoon - "Thank you. But 'our song' needs a Moog synthesizer. MINE REALLY DOES! While writing that top 10, I did a quick comparison to the ARP newsletter I blogged about late last year. The first thing I noticed was that both are strictly a black and white print job on a thicker stock paper. Start reading, and you find very similar content too, including Q&A sections, news and photos of famous users (name droppin'! ), and a splash of technical info. 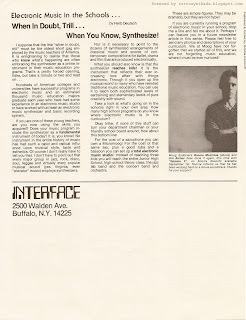 But, not sure if that is a fair comparison - a 1980 Moog newsletter to a 1974 ARP newsletter. So, I decided to pull out an ARP newsletter from June 1980 and see how they stacked up. I don't want to give too much away, since I'll be posting that ARP newsletter in the near future, but one thing did make me a little jealous for the '80s... both newsletters are giving away flashy SATIN JACKETS! I may have to sport my flashy satin jacket at work tomorrow! Korg Sigma synthesizer pre-launch advertisement from page 31 of Contemporary Keyboard Magazine June 1979. This Sigma pre-launch ad appeared once in CK one month before the introductory ad I blogged about in my last post. Visually, I love the ad with its torn cardboard box corner that teases readers, giving them a glimpse of exactly what sets the Sigma apart from the competition - a performance machine with two joysticks. Plus, assuming it was intentional, Korg was wise to run both ads on *exactly* the same page of the magazine. I'm sure I'm not the only creature of habit when it comes to reading synthesizer magazines. Even so, I don't think it built up the anticipation to the extent that Korg was trying to achieve. The main problem is that this ad only ran once. A single well-placed full-page ad may work in 2010 with our info-at-the-speed-of-the-Internet lifestyle. But not in 1979. This ad should have ran for two or three issues to build up the anticipation more. "A completely new type of electronic music synthesizer is scheduled for marketing in your area. This highly versatile instrument is outstanding for live performance situations. If you are creatively inclined and eager to explore new fields of musical possibilities, be on the lookout for further announcements. Exciting innovations make this model worth waiting for. " Seriously? "...scheduled for marketing in your area". That is supposed to get me excited? Also, the Spec Sheet section at the end of the same issue of CK announces the Sigma - including the unique fact that it has two joysticks - the *only* thing noticeable in this ad. Maybe not everyone read CK front-to-back and would connect the dots, but I sure would. What a way to spoil the surprise. At least they didn't include a photo in the Spec Sheet section. Finally, Korg was flooding CK with advertising during this time period. 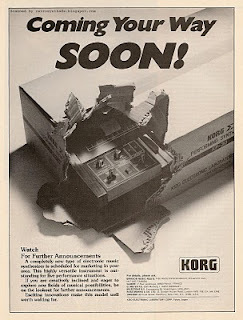 There were three other Korg ads appearing in CK during Sigma's pre-launch and intro-ad period (June and July 1979), including the very technical MS-20 and MS-10 ads, and the not-at-all-technical VC-10 ad. A reader is either going to remember all four ads because they are a Korg-fanatic, or more likely, all that Korgmania is just going to get lost in a sea of gearporn. Much like when I was growing up and hanging out in our local music store with a recently hired Keyboard guy named Jim (name changed to protect the innocent). He would read Keyboard magazines front-to-back, and then get all the facts mixed up from the different articles and ads. "Did you read about the new Rhodes Mono/Poly? I heard it has the new sample-to-disk option but still has the patented Moog filter". Korg Sigma synthesizer introductory advertisement from page 31 of Contemporary Keyboard Magazine July 1979. 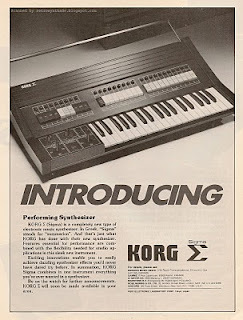 This introductory advertisement for the Korg Sigma synthesizer ran only once in Contemporary Keyboard magazine, a month after the synthesizer appeared in the June 'Spec Sheet' section of CK. 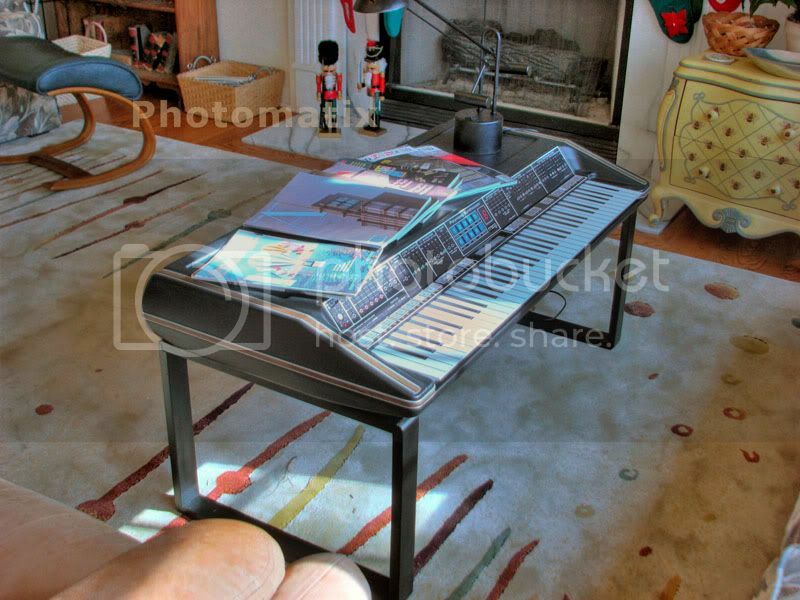 I didn't know much about this synthesizer when I first looked at the ad, but after only a bit of research I soon realized why Korg positioned this particular keyboard as a 'performing synthesizer'. A touch-sensitive keyboard with routing to pitch-bend, vibrato depth, and the mix of synthesizer/organ effects. Control inputs that includeVCO control voltage inputs, envelope generator trigger inputs, and VCO cutoff frequency control voltage inputs. And most awesome - two joysticks! One for pitch-bending, modulation, and pick noise depth control (! ), and the other for lowpass filter and highpass filter cutoff frequency adjustments. I also didn't realize just how popular this synthesizer is - a MATRIXSYNTH post from 2007 tells us that it is #69 in the top 100 synths according to to Peter Forrest's "A-Z of Analogue Synthesisers". And indeed, Sigma groupies' loving comments can be found on a number of synthesizer sites such as Vintage Synth Explorer and Harmony Central. A quick search on the InterWebz pulls up a number of Web pages concerning this synthesizer, confirming its popularity both for its oddness and ugliness. And that is *exactly* what Paul Ward calls it in his article that appeared in the June 2001 issue of Sound On Sound. Although he himself found the instrument 'generally nasal' and that he is 'not a great fan', he does admit that he had "heard enthusiastic waxings about the sound of the Sigma from time to time over the years". Gordon Ried's excellent online write-up pretty much poo-poos much of the Sigma's sound as well. "... all things considered, Instrument was a disappointment. Neither gutsy like the ARP, nor clean and precise like the Roland, its patches were bland imitations of their orchestral inspirations. Of the eleven voices, only the Electric Bass, Tuba, and Oboe deserved any real credit. The Horn and Fuzz Guitar were just about passable but others, in particular the Clavi and String, were - as solo sounds - to be avoided at all costs." But he does conclude that that the Sigma's "...design and a handful of its facilities put older preset monosynths to shame" and that it is "...a pity because the range of possibilities contained within its weird architecture was huge". Listen to an old 1979 audio advertisement posted on Synthtopia and judge for yourself. 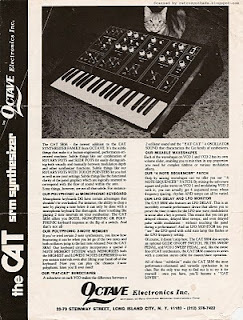 Octave Electronics CAT SRM fact sheet from around 1978. This fact sheet isn't in the best condition, but I had to post it for a few reasons. First, this fact sheet contains A LOT of great reference information - all in one document! The third reason I posted this fact sheet is because it contains no date on it, and I'm having a hard time putting a time-stamp on it. This fact sheet references Octave as a division of Syn-Cordian. Octave also included this line of text in the CAT SRM ad that ran from December 1977 - March 1978. 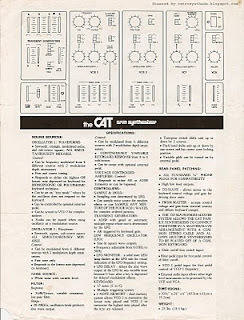 The next CAT SRM ad doesn't show up until August 1979 and that later ad references Octave as a Division of Plateau Electronics. So, it would make sense that this fact sheet was probably created sometime between December 1977 and August 1979. Also, usually fact sheets will take on a bit of the personality of the rest of the marketing material. This fact sheet definitely doesn't have the look of any of the advertising done by Octave before March 1978. No synth hero or illustrated stylized cat synthesizers here - just a good solid close-up of a CAT SRM (WITH A REAL CAT!). Sure, a fact sheet SHOULD have a close-up the actual synthesizer, but if it was part of any earlier advertising, I would have expected some graphic elements to cross over. So, I can probably narrow down the publication date to sometime between March 1978 and August 1979. "The CAT SRM - the newest addition to the CAT SYNTHESIZER FAMILY from OCTAVE." If this fact sheet had come out later in the CAT SRM's life cycle, it probably wouldn't have introduced it as the 'newest addition' to the family. So, I'm thinking we have a fact sheet that was created some time earlier in the CAT SRM's life. Probably early- to mid-1978. One thing is kinda throwing me for a loop though. This fact sheet is part of the Home Demo Kit that appears in the CAT SRM and Kitten ad that ran from August 1979 until February 1980 (you can see it peaking out from behind the record in the bottom left image in the ad). That ad references Octave as a division of Plateau Electronics - so either this fact sheet was re-printed later on with new affiliation information, or they must have had a lot of old stock on hand. End note: This fact sheet also throws out another term near and dear to my heart - the term 'Human Engineered' in the second sentence of the fact sheet. 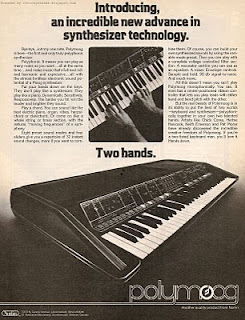 Octave's major rivals ARP and Moog were using similar buzzwords in advertisements and promotions around this time period. I've blogged about ARP using 'Human Engineering' in a number of ads and newsletters including these ones from 1974 and 1976. Moog used a similar term - 'Musical Engineering', including in this ad from 1977. It would make sense that competitors of ARP and Moog would also try and pepper some of their promotional pieces with similar buzzwords - and it looks like Octave definitely did.